Discover the many delights of the World Heritage-listed Kakadu National Park. Visit billabongs, spot crocodiles and immerse yourself in the ancient stories of this land. A dinner cruise on Katherine Gorge is a highlight, as is spending time on the breathtaking Ord River. Journey along the famed Gibb River Road to El Questro Wilderness Park and marvel at the beauty of Chamberlain Gorge. Have a yarn with a traditional land owner and share a cup of tea with an old drover; the people you meet along the way will be just as memorable as the landscapes you encounter. Bid farewell to your new friends in Broome, but not before exploring the tropical waters and pristine beaches of this gorgeous town. Welcome to Darwin. Enjoy a two night stay, beginning with a welcome dinner. Choose a cruise on the Adelaide River, home to the ‘jumping crocodiles’ or take a day trip to Litchfield National Park. Alternatively, enjoy a sunset cruise on Darwin Harbour, take the hop-on-hop-off bus around town or do the WWII Bombing of Darwin tour. Travel to the amazing World Heritage-listed Kakadu National Park and marvel at ancient Aboriginal rock art at Nourlangie Rock. Visit Bowali Visitors Centre for a greater understanding about the area before cruising on Yellow Water Billabong, spotting crocodiles and bird life. Enjoy an overnight stay. Optional flight - Take an optional flight over Kakadu National Park for a bird’s eye view of the wetlands and rocky terrain. (Additional expense). Heading south, you’ll stop at Pine Creek, named after the many pine trees that Overland Telegraph workers found during the construction of this incredible telegraph line, which connected Australia to the rest of the world in 1872. Visit Nitmiluk National Park, home to the breathtaking Katherine Gorge. Tonight, enjoy a Special Stay in Katherine, nestled in natural bush. Be transported into the spiritual world of the Jawoyn people and explore their culture and history on a dinner cruise through Katherine Gorge. Enjoy the stories with the magnificent backdrop of towering cliff faces that change colour as the sun sets. Journey to Western Australia and let the vast expanse of the Kimberley slowly reveal itself. Visit Lake Argyle, the largest lake in the Southern Hemisphere, and take a breathtaking cruise on the Ord River. Marvel at the vast variety of bird life, immense gorge walls and river scenery before arriving at your hotel. Optional flight - Take an optional flight over the Bungle Bungles for a chance to see the orange and black stripes of these massive sandstone structures. (Additional expense). Your local guide will take you on a tour of the farming region around Kununurra. Hear stories about how this town has become the ‘fruit bowl’ of Australia and learn about the region’s famous fragrant timber, the sandalwood tree. Travel along the Gibb River Road to the acclaimed El Questro Wilderness Park. Set in the untamed Kimberley landscape, El Questro began life as a working cattle station. Enjoy a two night Special Stay in deluxe tented cabins. Optional El Questro Homestead upgrade - Take the opportunity to upgrade your stay to the deluxe El Questro Homestead, an exclusive retreat perched atop the magnificent Chamberlain gorge. This will substitute accommodation and touring activities. (Additional expense, must be booked before departure). 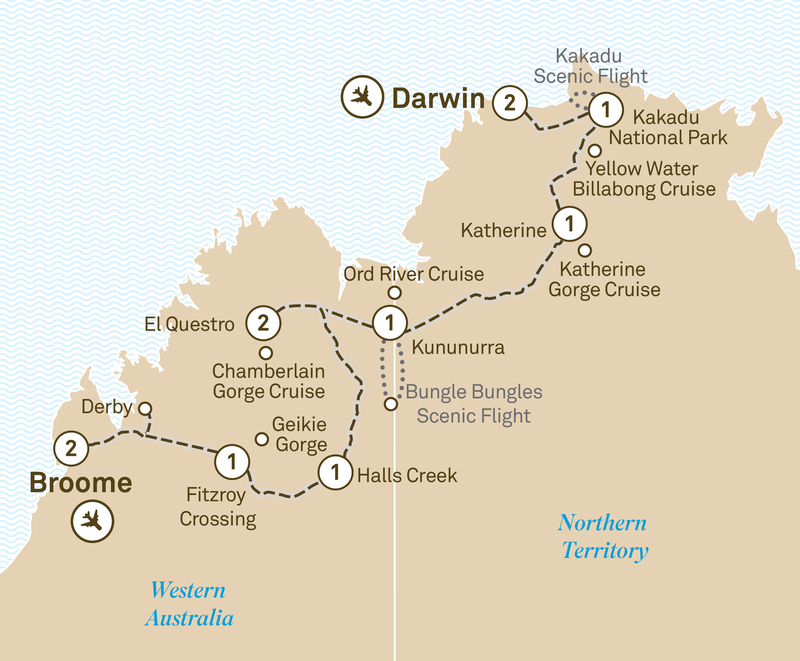 Choose to take a cruise through Chamberlain Gorge or a culture and history tour of El Questro, learning about traditional medicines, hunting techniques and the use of fire. Alternatively, join a park ranger on a bird watching tour. Relax over evening drinks at the airstrip while capturing stunning views of the sunset over the Cockburn Ranges. Visit the world’s largest single producer of diamonds on your tour of the Argyle Diamond Mine. Learn about the open cut mine and the original Indigenous inhabitants. Tonight, stay at the Halls Creek, on the northern edge of the Great Sandy Desert. Visit the Yiyili Aboriginal Community School for a chance to meet the principal, hear about the school and see the local artwork. Visit China Wall, a natural white stone wall that looks like the Great Wall of China. Cruise the Fitzroy River through the exquisite Geikie Gorge and keep an eye out for local wildlife, including sawfish, stingrays and freshwater crocodiles. Stay overnight at Fitzroy Crossing. Relish the opportunity to have a yarn with a traditional landowner whose grandfather was both a prisoner and prison warden at the remarkable Boab prison tree. View the tree and visit one of the oldest ‘supermarkets’ and ‘chemists’ in the world, without walls or cash registers. Enjoy a cup of tea with an old drover where you can sit and reminisce about the Kimberley cattle industry of old. Optional flight - Take an optional scenic flight over the azure waters and islands of the Buccaneer Archipelago including the incredible Horizontal Falls. (Additional expense). Arrive at the town of Broome, the jewel of the Kimberley. It’s the perfect place to relax with long stretches of white sand beaches and warm tropical waters. With a rich history in pearling and a strong multicultural foundation, you’ll fall in love with this unique town. Enjoy a two night stay. Discover the rare and beautiful Australian South Sea Pearl on a tour of Willie Creek Pearl Farm or enjoy a colourful and informative tour taking in the city sights on a Harley-Davidson Trike. Alternatively, soak up the views from the top of a camel along the famous Cable Beach or enjoy a town tour that includes sunset at Cable Beach. Finish the day with a farewell dinner with new-found friends as you reminisce about your adventures. Optional flight - Take the opportunity to fly in a seaplane and experience the Horizontal Falls on an exhilarating ride. (Additional expense, replaces Scenic Freechoice activities). It’s time to leave the wonders of the Kimberley behind and head home, taking beautiful memories with you.